Impact Tester utilizing weight falling from high location to impact paint film, it can measure resistance to Impact of paint film. According to standard design of GB1732-79, utilizing weight falling from high location to impact paint film, it can measure resistance to Impact of paint film. 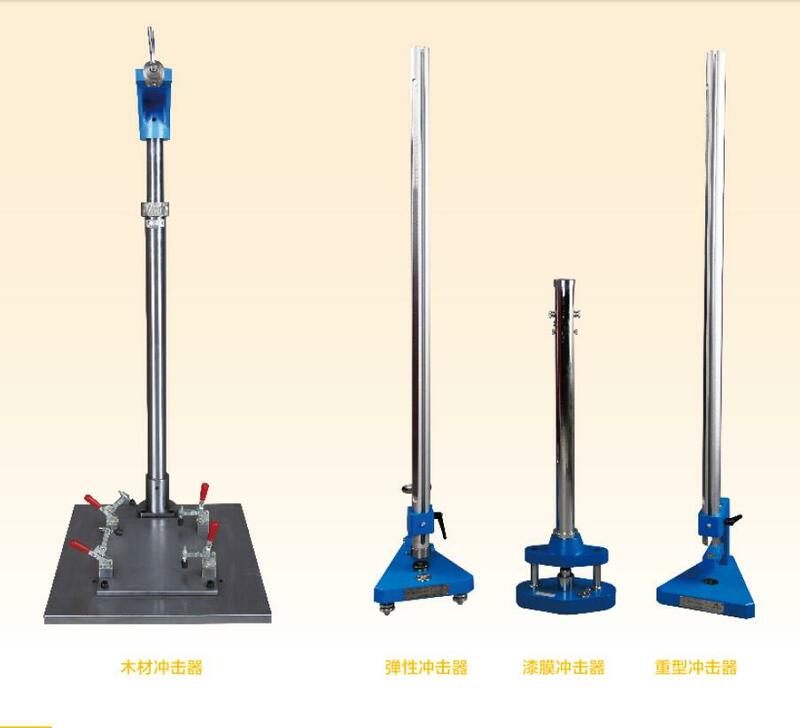 TCJ-II Impact Tester is to test the resistance of a coating film and its substrate to the effects of rapid deformation. International Standards describe a method for evaluating impact resistance of a coating to cracking and peeling from a substrate when it is subjected to a deformation caused by a falling weight, dropped under standard conditions yielding rapid deformation. Test method is in accordance with the specification of ISO6272、ASTMD2794、NCCAII-10 (II-6、II-16) and X-1、ECCA Meth.No.5、NFT30-039. Also test method is to adjust the height and weight of the impacter to determine exact point of failure or establish pass/fail specifications. Heavy-Duty Impact Tester has gained wide acceptance in testing the impact resistance of many types of coatings from paints to varnished to tough plated, plastic or laminated coatings. it is also widely used to establish quality control standards for resistance to impact surface damage and penetration of many construction materials including plastic, resins, fiberglass, sheet materials, and plywood. Test is in accordance with the specification of ISO6272、ASTMD2794、D3029、D4226 & other waterbased wood lacquer standard. Also one test method is to adjust the height and weight of the impacter to determine exact point of failure or establish pass/fail specifications & Classifying test is to gradually increase the distance the weight drops/ or by using an additional weight until damage can be seen. Applicable to determine the impact resistance performance of products，such as hard board，finished hard board and impregnated paper laminated wood floor, etc. The height of this instrument can be adjusted. Comply with standards: GB/T17657、GB/T18102. 1.After actual drying of paint film, put the sample plate which is coated paint film facing up on the cast-steel anvil (2). The portion of sample plate, which is impacted, must be more than 15mm apart from edge. If the sample plate is tested several times, we must pay attention to that every impacted point edge must be more than 15mm apart from others. 2.Using controller fixed screw (5), fixed the height according to product standard stipulation. 3.Lifted the hammer by hammer fixed screw (8), hanger on the hammer is automatically hung by the controller. 4.When push the control pin (7), hammer is free falling on the punch (3). 5.Lift the hammer, take the sample plate out, and observe the paint film whether it is cracked, wrinkled and peeled off or not by 4x magnifier. 6.If there is suitable instruction in the product standard, special paint film on the sample plate facing down on the cast-steel anvil is tested using anti-impacting method. 7.Experiment must be undertaken on the condition of constant temperature and constant humidity. 1. Place the collar onto the guide tube from above and fix at the required height. In order to limit the indentation depth of the falling weight, distance rings of different thickness can be fitted. 2. Place sample under the punch, place the test plate on the die, with the coated side upwards or downwards. The coated or uncoated side of panel can be tested to simulate either indentation or bulging. Fix the test plate by using the clamping device (8). Turn the hand wheel (3). Lift the weight to the desired height on guide tube and let it drop. 3. Observe the damage of the sample through the magnifying glass. The panels are examined to evaluate crack resistance and detachment from the metal substrate of coated surface which is coated with paint under standard condition. 4. The test should be carried out in at least 4 different places on the test panel not less than 4cm from each other. Repeat four tests on the different locations of test panel (total 5 falling weight points). If there are at least 4 test points which don’t have cracking and/or detachment from a metal substrate, it indicates that coating is qualified. 1. Place the collar(2) onto the guide tube from the above and fix at the required height. In order to limit the indentation depth of the falling weight, distance rings of different thickness can be fitted. 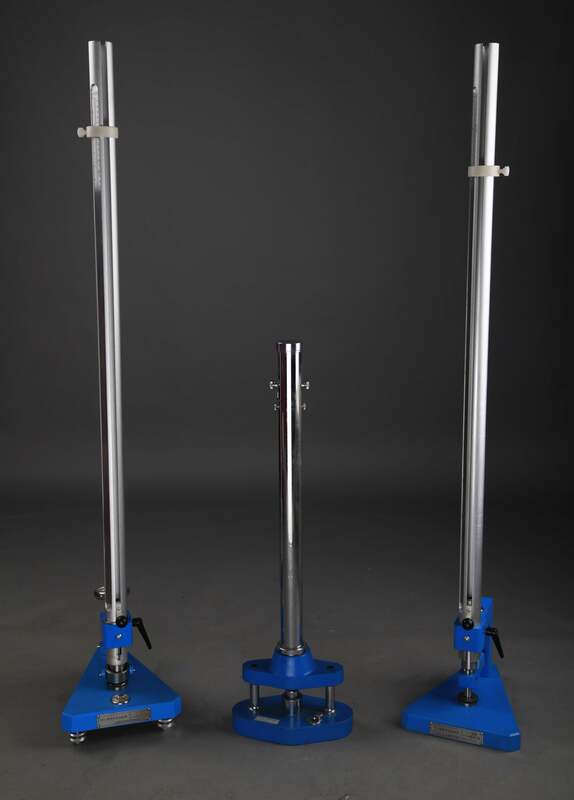 Adjust the height and weight of the impacter to determine exact point of failure or establish pass/fail specifications. 2. Place sample under the punch with the coated side upwards or downwards. For testing, place the panel on the die with the coated side either up or down depending upon the application. Fix the panel by using the clamping device (8). Thus the indentation can be either an intrusion or extrusion Turn the hand wheel (3). Raise the falling weight to the required drop height and release it. 3. After every test check the test panel for damage, observe the damage of the sample to evaluate impact resistance of a coating to cracking and peeling from a substrate. Testing should normally be started at a low load ( small weight, small drop height ). Starting with the falling weight 1kg (2 pounds), height in 25mm (1inch) increments or 25mm (1inch) multiple, the test is continued until reaching the point at which the film shows cracks. If testing is started at maximum height, the first cracking is not visible, repeat the test with 2kg (4pounds). The impact energy is increased by increasing the drop height or by using an additional weight until damage can be seen. 4. Once viewing cracking at the desired height, do the following procedure: Lift the weight to this desired height、25mm (1inch) higher than this desired height and 25mm (1inch) lower than this desired height on guide tube and let it drop 5 times at each height, that is, total 15 times. 5. Observe the surface of the test panel through the magnifying glass to evaluate crack resistance and detachment from the metal substrate of coated surface and list statistical table to establish pass/fail outcome of 15 points. Adjust the height and weight of the impactor to determine exact point of failure or establish pass/fail specifications. 6. If using the above procedure, damage can’t be seen, repeat (4)(5) procedures to determine exact point of failure. 1. Place the collar onto the guide tube from above and fix at the required height. 2. Place sample under the punch, place the test plate on the die, with the coated side upwards or downwards. The coated or uncoated side of panel can be tested to simulate either indentation or bulging. Fix the test plate by using the clamping device. Turn the hand wheel. Lift the weight to the desired height on guide tube and let it drop. 5. Pass/fail specifications for waterbased wood lacquer standard is Falling weight 300g&Punch 12.7mm corresponding to waterbased wood lacquer standard. Test two test panels.There are total 5 falling weight points on one test panel. If there are at least 3 test points which don’t have cracking and/or detachment from a metal substrate, it indicates that test is passed. 1. Raise the weight up the tube to the required height where it is expected that no failure will occur. 2. Place sample under the punch. Place the panel on the die, with the coated side either upwards or downwards. The coated or uncoated side of panel can be tested to simulate either indentation or bulging. Fix the test plate by using the clamping device. Turn the hand wheel. Lift the falling weight to the required drop height on the guide tube and let it drop. 3. Remove the test panel from the apparatus and observe the impact area for cracks in the coating. If no cracks are evident, repeat the procedure at a greater height, increasing 1 in (25mm) at a time or 25mm (1inch) multiple, the test is continued until reaching the point at which films shows cracks. If testing is started at maximum height, the first cracking is not visible, repeat the test with 2kg (4pounds). The impact energy is increased by increasing the drop height or by using an additional weight until damage can be seen. 4. Once visible cracks are observed, repeat the test five times at each of three height; slightly above, slightly below, and at that determined in the first trial. Test in a random fashion so that all impacts from one height are not made in succession or on one panel. 5. Observe the surface of the test panel through the magnifying glass to evaluate crack resistance and detachment from the metal substrate of coated surface and list statistical table to establish pass/fail outcome of 15 points. For each inch-pound (kilogram-metre) level, tabulate the number of times the coating passed or failed. The value where the results change from mainly passing to mainly failing is the impact failure end point.